The Chrono is another bridled C hybrid kite, but aimed towards the freeride/performance side of the market. It has 6 struts to provide a very efficient central section for plenty of oomph. Its one pump and comes with the usual reinforcements you expect with most kites, aramid patches, strut bumpers, and heavy duty material on the struts, leading&trailing edges and close to the wing-tips. Like the other kites in the Takoon range, the Chrono is also one pump affair, but because of its size gives you a real pre-kite work out! 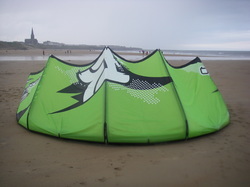 The bar is similar to that of the Furia, with two small differences: the safety line is covered in plastic tubing, and the safety deploys onto both front lines of the kite rather than one. It also comes with the standard 2 front and 3 rear attachment options to tune turning speed, bar pressure and de-power. When you get the kite in the air, its immediatly obvious how nicely it flies - forward in the window and with bucketloads of power and a great bottom end. It responds well to bar input and turns well for a kite of this size; bar pressure is moderate and feedback is decent too. The 15m Chrono is a great lightwind kite, plenty of grunt, easy relaunch even in light winds, and its very impressive how you can just park it and ride in conditions you wouldn't expect. I was surprised to see how nice the kite was to do freestyle with, it boosts very well with great hang time due to the nice float you get down from the top. Its great to hold grabs for a loooong time and really get the style in. I also really enjoyed unhooking on the Chrono - It's not an ideal kite for it, but you get some huge pop from its powerful canopy and the moderate bar pressure is good for knowing what the kite is doing. I'm really happy with the 15m chrono, it gets me going and doing tricks in conditions which a lot of people would just stay home, its great for free-riding and should have everything needed to be very effective race machine.